Bathmaster's Sonaris Bath Lift is a battery-operated device that's easy as pie to install. Simply place the unit in the bottom of your tub and it's ready for use! 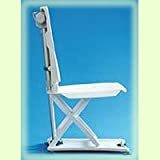 The seat and back disconnect and reconnect quickly, which makes the Sonaris a good option for bath lift users who need their mobility aid on vacations or trips away from home. The lift seat and reclining back are both operated via a hand control that uses smart technology to prevent the user from lowering the lift if the battery is too low to raise the person back out of the tub. An indicator light and warning tone will alert you when your battery needs to be recharged! The Sonaris Bath Lift comes with a 5-year warranty on the frame and a 2-year warranty on the hand control and recharger.